You’ve either made the leap into accounting outsourcing, or you’re putting some serious thought into it anyway. Good move! Your business is going to love you for it. But we would like to humbly suggest that there’s a good chance you’re not milking outsourced accountant services for all their worth. First, you should be clear on the fact that outsourcing is not only about reduction – a reduction in in-house staff (and their computers, furniture, etc…) and in overhead. That jump up to 42% in profits is very nice, but that’s only the first step. The second step is understanding that outsourcing accounting is fundamentally about growth. It’s about pruning away any wasted money, effort, and time at your end in order to allow you to expand your business and what it has to offer. Firms that understand the growth factor of Outsourced accountant services can still fall short in using its full potential. They’ll outsource components of their business where they find themselves thin in in-house talent or positions that they’ve had a hard time keeping filled. But chances are there’s still more pruning to be done. How do you know where there’s still waste that can be cut away? Investigate your business as it is today, and then take a look at where you want it to be a year from now, then five years, then ten. Many of the firms that are the most successful at Outsourced accountant services are the ones that envisage themselves as lean-mean client-pleasing machines. In other words, everything about their business that does not involve direct liaisons with the client can be shipped overseas. What they retain in-house in Australia or New Zealand is their version of you (of course), the face of your firm, the one the clients get to know the best and rely on for financial advice. They’ll also have an in-house administrator who is the funnel through which flows all the information from you (and your clients) through the cloud to your Outsourced accountants, and then back again in the form of queries and returns. Additional in-house staff does quality control checks. And that’s pretty much it. All of the number-crunching is done overseas at a very competitive rate when you consider BOSS removes all you training costs, HR woes and other on-costs! 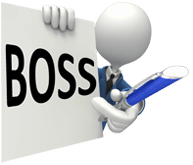 What Can BOSS Do for You? Self-managed Super Fund compliance and taxes. By sending the numbers work offshore you’re freed up to get proactive in guiding your clients’ personal and business affairs. In essence you become the face of their healthier and more robust financial well being… not a bad relationship to have with a client. In the immediate future, take a look at your work flow. Where are clients’ files getting bogged down? Do you have any points where you have people doing work that they’re not suited for, that you didn’t hire them to do? After that’s done it’s time to start figuring out where you want your firm to go. How many accounting services do you want to offer? How many clients do you want to have? What role do you personally want to play? And now it’s time to bring outsourced accountant services into the mix to help you prune away the waste, shaping your agency’s future in the direction you want it to grow.